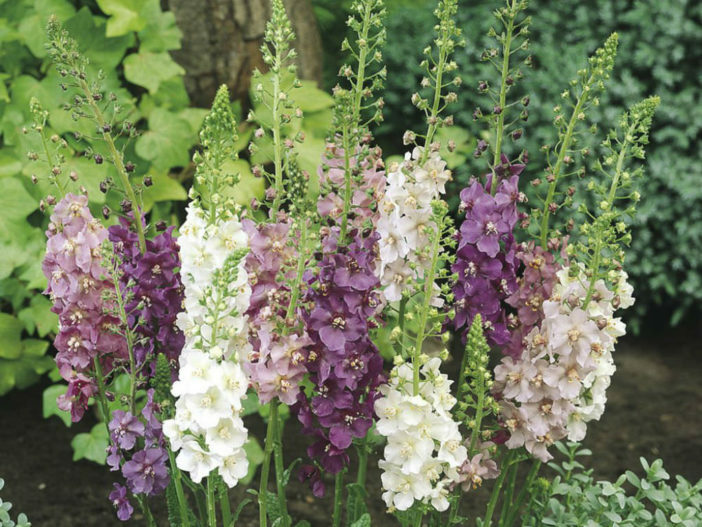 Verbascum is a genus of about 250 species of flowering plants, commonly known as Mullein. They are native to Europe and Asia, with the highest species diversity in the Mediterranean. The species are biennial or perennial plants, rarely annuals or subshrubs, growing to 1.6 to 10 feet (0.5 to 3 m) tall. Its common name is derived from the Latin word “mollis”, meaning “soft”, which most likely refers to its soft stem and leaves. Its botanical name, on the other hand, comes from the Latin word “barbascum”, which means “beard”, a reference to the plant’s shaggy appearance. Mullein is an attractive, flowering, landscape plant with a rich history as an herbal remedy. When it is grown as an herbal remedy, every part of the mullein plant is usable at different times during its life cycle. The thick, soft leaves are made into a tea to treat respiratory illness by loosening congestion and helping clear the lungs. The tiny hairs on the leaves can be irritating, and any teas should be filtered carefully to avoid this problem. A tincture of mullein alleviates this problem, although it is extremely bitter. Mullein needs a spot with full sun or partial shade and sandy or loamy soil that is drains well. The roots are likely to rot in wet soil. A slightly acid pH is a plus, but not absolutely necessary. Rich soil leads to sprawling plants and weak stems that are likely to flop. Trim established Mullein to neaten them in early spring. If you set out new plants in spring, water them weekly for the first month if it hasn’t rained. Established plants rarely need watering in spring. Mulch around the plants before the end of spring to moderate the soil temperature, discourage weeds and prevent seeds that fall to the ground from making contact with soil. Species varieties self-sow readily, but hybrids don’t. Stake tall Mullein before the spikes become heavy with flowers. Tie the spikes loosely to the stake so they can move with the wind. Once the flowers fade, cut off the spike at the base. This extends the flowering season and prevents self-sowing. Although Mullein tolerates drought, the plants look their best if you water them during prolonged dry spells. Apply the water slowly, allowing the soil to absorb as much as possible. This encourages deep, spreading roots. Fall brings another opportunity to set out new plants. Keep them well watered for the first month. Cut down the remaining flower spikes in fall, but leave the foliage in place. Mullein doesn’t need fertilization and does best if you don’t add any organic matter. The plants don’t need regular division to stay healthy, but if you want to propagate it, fall is the best time to divide.